By sharing his answers to these questions, he modeled for the 350 authors and illustrators who attended some of the ways he focuses on, and reaches, his goals. So we StorySleuths decided to ask him our own questions, focused on the craft of writing, which he graciously answered. His responses are below. StorySleuths: On your website, you posted an intriguing page of starts, all but one crossed out, for Flight of the Dodo. We're wondering if those are from real first drafts, or if they are created to make your point that picture books are tough to write (we're not expecting you to reveal any trade secrets!). We're wondering if you have a similar set of openings for The Curious Garden, and if so, what they were. How did you develop that important opening paragraph? PB: The page of starts on my website was created specifically to illustrate my point that from many bad ideas came one good idea for the opening of Flight of the Dodo. The Curious Garden took such a long time to develop that there was never a page of starts. Mostly I tinkered with big story concepts in my workbook, and typing on my computer, until I had the major story arc resolved. Then I went back-and-forth between writing and sketching and gradually shaped the wording for each page. StorySleuths: You say, "I usually do a lot of bad writing before I figure out how best to tell my story." Do you have previous drafts of The Curious Garden? We'd be interested in what changes you made as you revised the text. PB: I'd rather not reveal the early drafts of TCG simply because the process took so long, and the story evolved so much over time, that the early drafts feel more like a different story entirely...a story I may end up developing into a new book some day. StorySleuths: We've heard Maurice Sendak say that he completes the text for his picture books before starting the illustrations. Do you work this way too, or do you work on text and illustrations together? PB: I work on the text and illustrations simultaneously. I usually begin by working through the text, and make notes for how I envision the illustrations that might accompany the words of each page. But eventually I hit a wall in that writing process and need to work through some of the sketches before deciding how to proceed with the writing. StorySleuths: The Curious Garden is a very visual concept. Your Author's Note indicates that you were inspired to write the story by the lush garden that has developed on the abandoned elevated railway on the west side of Manhattan. Did the idea for the story emerge more from images you wanted to paint, or from a story you wanted to tell? 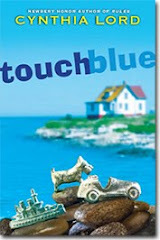 PB: It started visually, with me imagining beautiful, whimsical scenes of a boy in his own private city wilderness. But eventually I realized that I hadn't created much of a conflict, and so I began to figure out what was at the heart of the story I was trying to tell. After I worked out the big story arc I got into my usual pattern of back-and-forth between writing and sketching. StorySleuths: What changes and revisions in the text did your editor suggest? Were there changes that your editor suggested that you both decided, after considering them, not to make in the final text? PB: I worked on this book for about 3 years before signing it up with Little, Brown and Co., and then spent over a year working on it with my editor, Alvina Ling. It was such a long, strange process, that I can't quite remember all the changes that the story went through. But at one point, the book wasn't focused as much on the community theme, and in the pages where the garden was transforming the city we didn't really see many other people. The effect was that it looked like the plants were INVADING the city, which obviously wasn't the story I wanted to tell. So I decided that instead of just having Liam be the lone gardener, it would be much more powerful if he created a gardening movement, which in turn would better explain how the city could go through such dramatic changes. StorySleuths: You can see from our post PASSAGE OF TIME: The Curious Garden that we were fascinated by the way you handled the passage of time in the story. At what point in writing the story did you decide to move the story so far back in the past and so far forward into the future (from the predominant action in the story)? PB: I wanted to make this story seem as believable as possible. Nobody would believe that a city could go through such a dramatic transformation in a short period of time, so I really had no choice but to draw the story out over a couple of decades. But that passage of time also worked to show that Liam stuck with his gardening for the long term, which reinforced some of the other themes in the book. 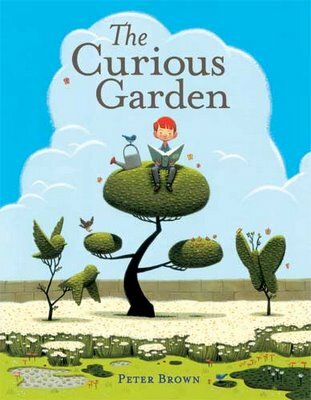 StorySleuths: Could you share one Writing Tip that you learned in the process of writing The Curious Garden? PB: I learned the power of wordless pages. TCG has four of them, and I think they were very effective in creating a peaceful, quiet, dreamlike setting. Wordless pages might not work for every story, but authors should remember that it is possible for them to write a wordless picture book (that could be illustrated by someone else). I think the exercise of writing a WORDLESS picture book could do wonders to improve an author's understanding of the medium. Thank you, Peter Brown. Thank you for your memorable website, your stunning books (note StorySleuths readers: click on the sheep to hear them baaaaa), and especially for sharing your wisdom, experience, and insightful writing tip with us. StorySleuths' Tip #63: Peter Brown says, "Remember that it is possible to write a wordless picture book (that could be illustrated by someone else). The exercise of writing a WORDLESS picture book could do wonders to improve an author's understanding of the medium."